I took this photograph when I heard that Back’s Winebar was closing. The last day of trading was Saturday 3rd of April 1971. It had been a part of the Norwich scene at 3 Haymarket for seven generations. I was an occasional visitor to the Winebar since I was 18 in 1967. The ground floor held the off-licence, but downstairs in the cellar you could sit with your lunchtime tipple. This took you back centuries to before 1501, when John Curat built the part above ground. The vaults are reputed to belong to an even older house inhabited by Norwich’s Jews in the middle ages. Since the Jews were expelled from England in 1290 this must be a structure of considerable antiquity! Looking at the bland glass shop front of JD Sports you would never guess what a wealth of history lies within. Although he was not involved with the bars at Backs, Captain P. G. Back was a member of the well-known Norwich family. Something in my memory stirs and suggests his first name was Philip. I remember him as an old man; he must have been about 90 in 1970 because his Commission for Service (it was in the Royal Navy) dated back to the final years of Queen Victoria’s reign. It was said to have her signature on it, but did she really sign every officer’s commission? She must have done, though the job must have kept her busy with her pen. He was president of the Norfolk Nautical Research Society in 1970. Other members included the John Mills the chairman, Mr Gould (who deserves an article all to himself) and Robert Maltster. Robert Malster lived in Ipswich where he worked as a journalist for the East Anglian Daily Times, so he wasn’t a frequently visitor. I knew his father rather better as he lived in Norwich (in the Close) and was a regular at our meetings. Also a member was Rex Stevens who worked for Mann Egerton selling Rolls Royces. Rex lived in Wroxham. 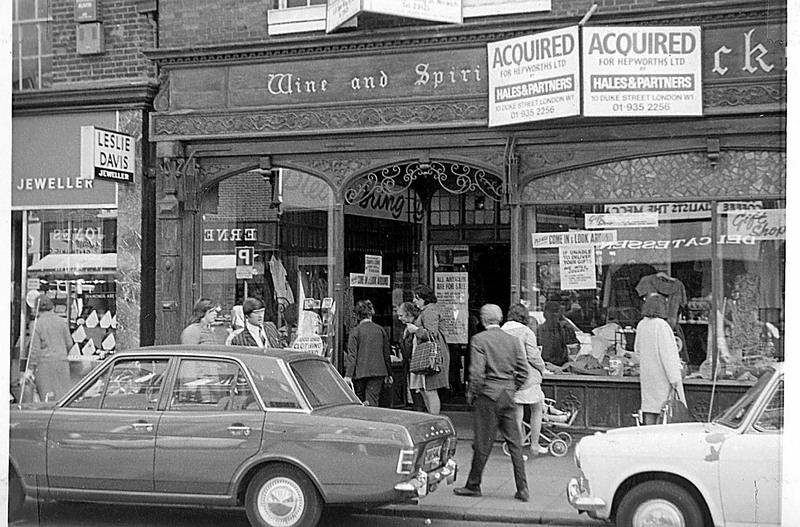 Back’s wine and spirit business had been taken over by Henekeys in 1948 but it retained the name. Another branch of the Back family was our solicitor Daynes Chittock and Back whose offices were in Opie House on the Corner of Opie Street. This firm became Daynes Keefe before becoming a part of the national organisation Eversheds. Eventually they closed their Norwich office which was in Princes Street; the nearest branch then being in Cambridge. I transferred my business to another solicitor in Norwich: I wonder where the copy of my will went? To Cambridge no doubt. Never mind, I have written another one since then. In the 1950s the Curat House was much better known because the oak lined room on the upper floor was open to the public, and used as a restaurant. The ground floor had a positive maze of Wine Rooms and bars. But even then a lot of the building was hidden from view; these were the rooms where the wines were stored and the Guinness was bottled. There are the remains of a family chapel from the days long ago when families had such things, and a number of fine fireplaces with ornate carved oak overmantles and Delft tiles. The latter are to be found in the Queen Anne’s Room. The Curat House has a rebus, a punning representation of the syllables of its name in pictures, in this case the letter ‘Q’ and a rat. It is a long way from Norfolk to Armenia, but in researching this essay I discovered that Rex Stevens’s father-in-law was Armin Wegner, the man who first recorded photographic evidence of the Armenian genocide during World War I. He was in the German Army, and the top brass wished for no publicity for these atrocities by their Ottoman allies. Against orders he smuggled the pictures back to Germany and the genocide became known. I had been aware that Rex had met his wife Sibyl in Italy during WWII when he was in the British army, but I had naturally thought that she was Italian. In fact she was born in Berlin, but her father had escaped to Italy in the 1930s after being interned in a concentration camp. This was for protesting to Hitler at his treatment of the Jews. Armin Wegner was a remarkable man. He was almost uniquely in speaking up for these persecuted peoples of the 20th century, and he bravely stood up for their human rights. He died aged 92 in 1978. His life is remembered by the Armin T. Wegner Society of the U.S.A. You can click on his underlined name to open pages with additional information.